Objective To evaluate the safety of home births in North America involving direct entry midwives, in jurisdictions where the practice is not well integrated into the healthcare system. Setting All home births involving certified professional midwives across the United States (98% of cohort) and Canada, 2000. Participants All 5418 women expecting to deliver in 2000 supported by midwives with a common certification and who planned to deliver at home when labour began. Main outcome measures Intrapartum and neonatal mortality, perinatal transfer to hospital care, medical intervention during labour, breast feeding, and maternal satisfaction. Despite a wealth of evidence supporting planned home birth as a safe option for women with low risk pregnancies,1–4 the setting remains controversial in most high resource countries. Views are particularly polarised in the United States, with interventions and costs of hospital births escalating and midwives involved with home births being denied the ability to be lead professionals in hospital, with admitting and discharge privileges.5 Although several Canadian medical societies6 7 and the American Public Health Association8 have adopted policies promoting or acknowledging the viability of home births, the American College of Obstetricians and Gynecologists continues to oppose it.9 Studies on home birth have been criticised if they have been too small to accurately assess perinatal mortality, unable to distinguish planned from unplanned home births accurately, or retrospective with the potential of bias from selective reporting. To tackle these issues we carried out a large prospective study of planned home births. The North American Registry of Midwives provided a rare opportunity to study the practice of a defined population of direct entry midwives involved with home birth across the continent. We compared perinatal outcomes with those of studies of low risk hospital births in the United States. The competency based process of the North American Registry of Midwives provides a certified professional midwife credential, primarily for direct entry midwives who attend home births, including those educated through apprenticeship. Our target population was all women who engaged the services of a certified professional midwife in Canada or the United States as their primary caregiver for a birth with an expected date of delivery in 2000. In autumn 1999, the North American Registry of Midwives made participation in the study mandatory for recertification and provided an electronic database of the 534 certified professional midwives whose credentials were current. We contacted 502 of the midwives (94.0%); 32 (6.0%) could not be located through email, telephone, post, or local associations, 82 (15.4%) had stopped independent practice, and 11 (2.1%) had retired. We sent a binder with forms and instructions for the study to the 409 practising midwives who agreed to participate. For each new client, the midwife listed identifying information on the registration log form at the start of care; obtained informed consent, including permission for the client to be contacted for verification of information after care was complete; and filled out a detailed data form on the course of care. Every three months the midwife was required to send a copy of the updated registration log, consent forms for new clients, and completed data forms for women at least six weeks post partum. To confirm that forms had been received for each registered client, we linked the entered data to the registration database. We reviewed the clinical details and circumstances of stillbirths and intrapartum and neonatal deaths and telephoned the midwives for confirmation and clarification. To verify this information we obtained reports from coroners, autopsies, or hospitals on all but four deaths. For these four, we obtained peer reviews. We contacted a stratified, random 10% sample, of over 500 mothers, including at least one client for every midwife in the study. The mothers were asked about the date and place of birth, any required hospital care, any problems with care, the health status of themselves and their baby, and 11 questions on level of satisfaction with their midwifery care. Our analysis focused on personal details of the clients, reasons for leaving care prenatally, the rates and reasons for transfer to hospital during labour and post partum, medical interventions, health and admission to hospital of the newborn or mother from birth up to six weeks post partum, intrapartum and neonatal mortality, and breast feeding. We compared medical intervention rates for the planned home births with data from birth certificates for all 3 360 868 singleton, vertex births at 37 weeks or more gestation in the United States in 2000, as reported by the National Center for Health Statistics,10 which acted as a proxy for a comparable low risk group. We also compared medical intervention rates with the listening to mothers survey,5 a national survey weighted to be representative of the US birthing population aged 18-44. Intrapartum and neonatal death rates were compared with those in other North American studies of at least 500 births that were either planned out of hospital or comparable studies of low risk hospital births. A total of 409 certified professional midwives from across the United States and two Canadian provinces registered 7623 women whose expected date of delivery was in 2000. Eighteen of the 409 midwives (4.4%) and their clients were excluded from the study because they failed to actively participate and had decided not to recertify or left practice. Sixty mothers (0.8%) declined participation. The figure provides an overview of why women left care before labour and their intended place of birth at the start of labour. We focused on the 5418 women who intended to deliver at home at the start of labour. Table 1 compares them with all women who gave birth to singleton, vertex babies of at least 37 weeks or more gestation in the United States in 2000 according to 13 personal and behavioural variables associated with perinatal risk. Women who started birth at home were on average older, of a lower socioeconomic status and higher educational achievement, and less likely to be African-American or Hispanic than women having full gestation, vertex, singleton hospital births in the United States in 2000. Of the 5418 women, 655 (12.1%) were transferred to hospital intrapartum or post partum. Table 2 describes the transfers according to timing, urgency, and reasons for transfer. Five out of every six women transferred (83.4%) were transferred before delivery, half (51.2%) for failure to progress, pain relief, or exhaustion. After delivery, 1.3% of mothers and 0.7% of newborns were transferred to hospital, most commonly for maternal haemorrhage (0.6% of total births), retained placenta (0.5%), or respiratory problems in the newborn (0.6%). The midwife considered the transfer urgent in 3.4% of intended home births. Transfers were four times as common among primiparous women (25.1%) as among multiparous women (6.3%), but urgent transfers were only twice as common among primparous women (5.1%) as among multiparous women (2.6%). Individual rates of medical intervention for home births were consistently less than half those in hospital, whether compared with a relatively low risk group (singleton, vertex, 37 weeks or more gestation) that will have a small percentage of higher risk births or the general population having hospital births (table 3). Compared with the relatively low risk hospital group, intended home births were associated with lower rates of electronic fetal monitoring (9.6% versus 84.3%), episiotomy (2.1% versus 33.0%), caesarean section (3.7% versus 19.0%), and vacuum extraction (0.6% versus 5.5%). The caesarean rate for intended home births was 8.3% among primiparous women and 1.6% among multiparous women. Breech and multiple births at home are controversial among home birth practitioners. Among the 80 planned breeches at home there were two deaths and none among the 13 sets of twins. In the 694 births (12.8%) in which the baby was born under water, there was one intrapartum death (birth at 41 weeks, five days) and one fatal birth defect death. Apgar scores were reported for 94.5% of babies; 1.3% had Apgar scores below 7 at five minutes. Immediate neonatal complications were reported for 226 newborns (4.2% of intended home births). Half the immediate neonatal complications concerned respiratory problems, and 130 babies (2.4%) were placed in the neonatal intensive care unit. Health problems in the six weeks post partum were reported for 7% of newborns. Among the 5200 (96%) mothers who returned for the six week postnatal visit, 98.3% of babies and 98.4% of mothers reported good health, with no residual health problems. At six weeks post partum, 95.8% of these women were still breast feeding their babies, 89.7% exclusively. Among the stratified, random 10% sample of women contacted directly by study staff to validate birth outcomes, no new transfers to hospital during or after the birth were reported and no new stillbirths or neonatal deaths were uncovered. Mothers' satisfaction with care was high for all 11 measures, with over 97% reporting that they were extremely or very satisfied. For a subsequent birth, 89.6% said they would choose the same midwife, 9.1% another certified professional midwife, and 1.7% another type of caregiver. Women who intended at the start of labour to have a home birth with a certified professional midwife had a low rate of intrapartum and neonatal mortality, similar to that in most studies of low risk hospital births in North America. A high degree of safety and maternal satisfaction were reported, and over 87% of mothers and neonates did not require transfer to hospital. A randomised controlled trial would be the best way to tackle selection bias of mothers who plan a home birth, but a randomised controlled trial in North America is unfeasible given that even in Britain, where home birth has been an incorporated part of the healthcare system for some time, and where cooperation is more feasible, a pilot study failed.31 Prospective cohort studies remain the most comprehensive instruments available. Our study has several strengths. Internationally it is one of the few, and the largest, prospective studies of home birth, allowing for relatively stable estimates of risk from intrapartum and neonatal mortality. We accurately identified births planned at home at the start of labour and included independent verification of birth outcomes for a sample of 534 planned home births. We obtained data from almost 400 midwives from across the continent. Regardless of methodology, residual confounding of comparisons between home and hospital births will always be a possibility. Women choosing home birth (or who would be willing to be randomised to birth site in a randomised trial) may differ for unmeasured variables from women choosing hospital birth. For example, women choosing home birth may have an advantageous enhanced belief in their ability to give birth safely with little medical intervention. On the other hand, women who choose hospital birth may have a psychological advantage in North America associated with not having to deal with the social pressure and fears of spouses, relatives, or friends from their choice of birth place. Our results may be generalisable to a larger community of direct entry midwives. The North American Registry of Midwives was created in 1987 to develop the certified professional midwife credential—a route for formal certification for midwives involved in home birth who were not nurse midwives and who came from diverse educational backgrounds. Thus the women who chose to become certified professional midwives were a subset of the larger community of direct entry midwives in North America whose diverse educational backgrounds and midwifery practice were similar to certified professional midwives. From 1993 to 1999, using an earlier iteration of the data form, we collected largely retrospective data on a voluntary basis mainly from direct entry midwives involved with home births approached through the Midwives Alliance of North America Statistics and Research Committee and the Canadian Midwives Statistics' Collaboration. This earlier unpublished data of over 11 000 planned home births showed similar demographics, rates of intervention, transfers to hospital, and adverse outcomes. As with the prospective US national birth centre study19 and the prospective US home birth study,23 the main study limitation was the inability to develop a workable design from which to collect a national prospective low risk group of hospital births to compare morbidity and mortality directly. Forms for vital statistics do not reliably collect the information on medical risk factors required to create a retrospective hospital birth group of precisely comparable low risk,38–40 and hospital discharge summary records for all births are not nationally accessible for sampling and have some limitations, being primarily administrative records. An economic analysis found that an uncomplicated vaginal birth in hospital in the United States cost on average three times as much as a similar birth at home with a midwife41 in an environment where management of birth has become an economic, medical, and industrial enterprise.42 Our study of certified professional midwives suggests that they achieve good outcomes among low risk women without routine use of expensive hospital interventions. Our results are consistent with the weight of previous research on safety of home birth with midwives internationally. This evidence supports the American Public Health Association's recommendation8 to increase access to out of hospital maternity care services with direct entry midwives in the United States. We recommend that these findings be taken into account when insurers and governing bodies make decisions about home birth and hospital privileges with respect to certified professional midwives. We thank the North American Registry of Midwives Board for helping facilitate the study; Tim Putt for help with layout of the data forms; Jennesse Oakhurst, Shannon Salisbury, and a team of five others for data entry; Adam Slade for computer programming support; Amelia Johnson, Phaedra Muirhead, Shannon Salisbury, Tanya Stotsky, Carrie Whelan, and Kim Yates for office support; Kelly Klick and Sheena Jardin for the satisfaction survey; members of our advisory council (Eugene Declerq (Boston University School of Public Health), Susan Hodges (Citizens for Midwifery and consumer panel of the Cochrane Collaboration's Pregnancy and Childbirth Group), Jonathan Kotch (University of North Carolina Department of Maternal and Child Health), Patricia Aikins Murphy (University of Utah College of Nursing), and Lawrence Oppenheimer (University of Ottawa Division of Maternal Fetal Medicine); and the midwives and mothers who agreed to participate in the study. Contributors KCJ and B-AD designed the study, collected and analysed the data, and prepared the manuscript. KCJ is guarantor for the paper. Funding The Benjamin Spencer Fund provided core funding for this project. The Foundation for the Advancement of Midwifery provided additional funding. Their roles were purely to offset the costs of doing the research. This work was not done under the auspices of the Public Health Agency of Canada or the International Federation of Gynecology and Obstetrics and the views expressed do not necessarily represent those of these agencies. Ethical approval Ethical approval was obtained from an ethics committee created for the North American Registry of Midwives to review epidemiological research involving certified professional midwives. .Meta-analysis of the safety of home birth.Birth1997; 24:4–13. .Choosing between home and hospital delivery. There is no evidence that hospital is the safest place to give birth.BMJ2000; 320:798. .Where to be born: the debate and the evidence. 2nd ed. Oxford:National Perinatal Epidemiology Unit,1994. .Listening to mothers: report of the first national US survey of women's childbearing experiences [monograph]. New York:Maternity Center Association,2002.www.maternitywise.org/listeningtomothers/ (accessed 3 Apr 2005). .Reports from council. Home birth policy rescinded.Toronto:CPSO,2001. .Midwifery.J Obstet Gynecol Can2003; 25:5. .2001-3: increasing access to out-of-hospital maternity care services through state-regulated and nationally-certified direct-entry midwives.Am J Public Health2002; 92:453–5. .Frequently asked questions about having a baby in the 21st century [monograph]. Washington; 12 Dec 2001. www.acog.org/from_home/publications/press_releases/nr12-12-01-4.cfm (accessed 3 Apr 2005). .Births: final data for 2000.National vital statistics reports.Hyattsville, MD:National Center for Health Statistics,2002; 50(5). .Home delivery and neonatal mortality in North Carolina.JAMA1980; 244:2741–5. .Outcomes of elective home births: a series of 1146 cases.J Reprod Med1977; 19:281–90. .Neonatal mortality in Missouri home births, 1978-84.Am J Public Health1987; 77:930–5. .Licensed midwife-attended, out-of-hospital births in Washington state: are they safe?Birth1994; 21:141–8. .Four years' experience with home birth by licensed midwives in Arizona.Am J Public Health1983; 73:641–5. 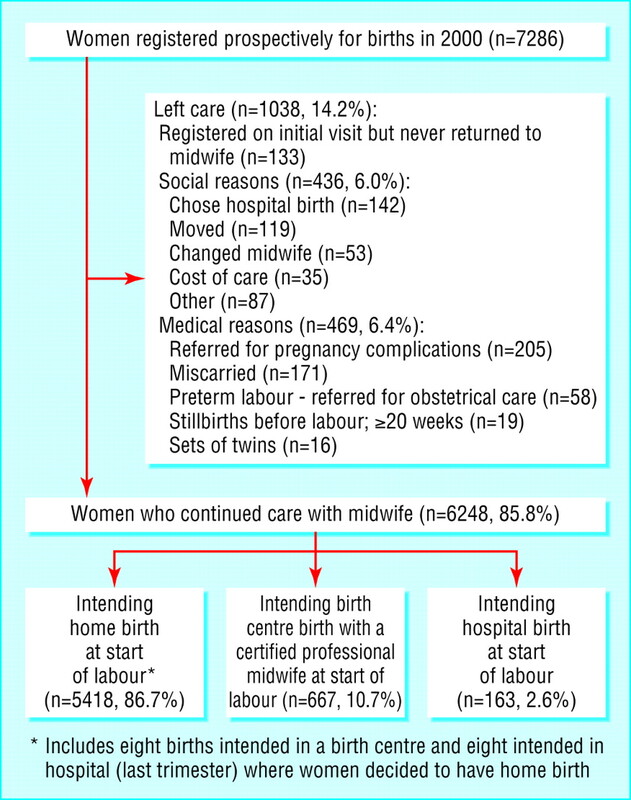 .Outcomes of 1001 midwife-attended home births in Toronto, 1983-1988.Birth1991; 18:14–9. .Neonatal outcome in planned v unplanned out-of-hospital births in Kentucky.JAMA1985; 253:1578–82. .The safety of home birth: the farm study.Am J Public Health1992; 82:450–3. .Outcomes of care in birth centers. The National Birth Center study.N Engl J Med1989; 321:1804–11. .Outcomes of 11,788 planned home births attended by certified nurse-midwives. A retrospective descriptive study.J Nurse Midwifery1995; 40:483–92. .Outcomes of planned home births in Washington State: 1989-1996.Obstet Gynecol2002; 100:253–9. .Safety of alternative approaches to childbirth. PhD thesis, California:Stanford University,1999. .Outcomes of intended home births in nurse-midwifery practice: a prospective descriptive study.Obstet Gynecol1998; 92:461–70. .Outcomes of planned home births versus planned hospital births after regulation of midwifery in British Columbia.CMAJ2002; 166:315–23. .Effect of fetal monitoring on neonatal death rates.N Engl J Med1978; 299:324–6. .Fetal monitoring in a community hospital. A statistical analysis.Obstet Gynecol1977; 50:269–74. .The use of obstetrical procedures in the care of low-risk women.Women Health1983; 8:25–34. .Safety of out-of-hospital births in the United States. In: Midwifery and childbirth in America.Philadelphia:Temple University Press,1997:345–84. .A prospective comparison of selective and universal electronic fetal monitoring in 34 995 pregnancies.N Engl J Med1986; 315:615–9. .Perinatal characteristics of uncomplicated postdate pregnancies.Obstet Gynecol1987; 69:296–9. .Should there be a trial of home versus hospital delivery in the United Kingdom?BMJ1996; 312:753–7. .Collaborative survey of perinatal loss in planned and unplanned home births.BMJ1996; 313:1306–9. .Home versus hospital deliveries: follow up study of matched pairs for procedures and outcome. Zurich Study Team.BMJ1996; 313:1313–8. .Outcome of planned home and planned hospital births in low risk pregnancies: prospective study in midwifery practices in the Netherlands.BMJ1996; 313:1309–13. .Perinatal death associated with planned home birth in Australia: population based study.BMJ1998; 317:384–8. .Authors reply: Perinatal death associated with planned home birth in Australia.BMJ1999; 318:605. .Outcomes of planned home births in Washington State: 1989-1996.Obstet Gynecol2003; 101:198–200. .The quality of the new birth certificate data: a validation study in North Carolina.Am J Public Health1993; 83:1163–5. .Validation of 1989 Tennessee birth certificates using maternal and newborn hospital records.Am J Epidemiol1993; 137:758–68. .The revised standard certificate of live birth: analysis of medical risk factor data from birth certificates in Alabama, 1988-92.Public Health Rep1995; 110:59–63. .The cost-effectiveness of home birth.J Nurse Midwifery1999; 44:30–5. .The medical delivery business health reform, childbirth and the economic order.New Brunswick, NJ:Rutgers University Press,2004.